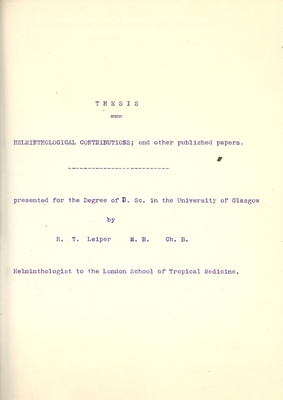 Robert Leiper's life-time work undertaking the study, classification of parasitic worms and their effect on their hosts led him to be described as the world's foremost helminthologist in 1956. Taking part in the Egyptian Government's helminthological survey in Uganda in 1906/07 he described several new species of intestinal nematodes in elephants. In 1909 he identified the parasite, Trichostrongylus pergracilis, as the cause of Grouse Disease. His many important contributions included the incrimination of Chrysops in the transmission of Loa loa, the development of S. mansoni in Bulnius snails and S. haematobium in Planorbis and the mode of infection by cercariae boring through the skin and, with Patrick Manson, the life cycle of Dracunculus medinensis in its copepod host. Leiper also conclusively showed experimentally that Schistosoma mansoni and Schistosoma haematobium were distinct species. He was instrumental in initiating schemes to control schistosomiasis (snail fever) and dracunculiasis (guinea worm disease)and advocated the need for supplies of fresh water to prevent water-borne parasitic infections. Robert Leiper also made lasting contributions to our understanding of the biology and taxonomy of species infecting humans belonging to the genera Opisthorichis (Clonorchis), Metagonimus, Echinochasmus, Metorchis, Fasciololpsis, Necator, Ancylostoma, Enterobius, Onchocerca, Mansonella, Gnathostoma and larval tapeworms as well as descriptions of other worms including potato eelworm. Born 17 April 1881, Kilmarnock, Scotland. 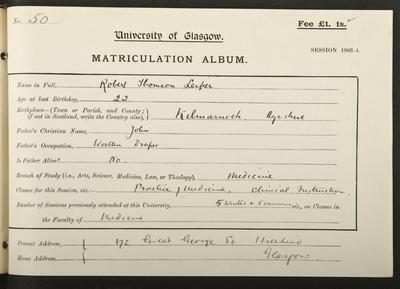 Robert Thompson Leiper was a Glasgow graduate and a distinguished helminthologist who made ground-breaking discoveries about parasitic worms. Leiper was born in Kilmarnock in 1881 and educated at Warwick School and Mason University College, Birmingham. 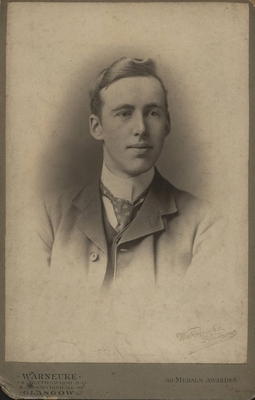 He then began his studies at Glasgow University's medical school, graduating with an MB ChB in 1904. His interests were in research and he won a Carnegie scholarship in Biology. His focus was firmly on helminthology, a subject in which he became the first lecturer at the London School of Tropical Medicine in 1905. He travelled extensively. In 1906-07, while working under Arthur Looss in Cairo, he became interested in the human blood-fluke Schistosoma, the cause of bilharzias, a disease endemic in the Nile Delta. Leiper's major research enabled him to unravel the complexities of its lifecycle and show that there were two schistosomes in Egypt, each with a different lifecycle. 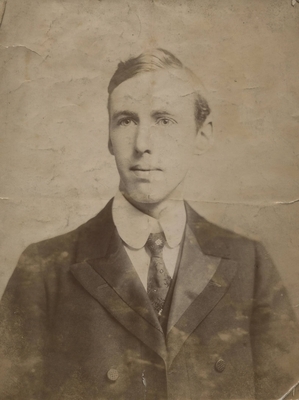 He continued to accumulate Glasgow degrees, DSc in 1911 and an MD with Honours in 1917. In 1919 he was appointed Professor of Helminthology at the London School of Tropical Medicine and in 1924 director of the Department of Parasitology. He was elected FRS in 1923 and FRCP in 1936, and he was appointed CMG in 1941. In 1955 he received an Honorary LLD from the University of Glasgow. Other prestigious honours included the Mary Kingsley medal of the Liverpool School of Tropical Medicine and the Bernard Nocht medal from the Tropeninstitut in Hamburg. He died on 21 May 1969 in St. Albans. World Changing Project, "Discovery and understanding of types of parasitic worms," in University of Glasgow World Changing (University of Glasgow, 2010); http://www.worldchanging.glasgow.ac.uk/article/?id=75 (accessed April 24, 2019). World Changing Project. "Discovery and understanding of types of parasitic worms." In University of Glasgow World Changing. University of Glasgow, 2010. http://www.worldchanging.glasgow.ac.uk/article/?id=75 (accessed April 24, 2019). World Changing Project. "Discovery and understanding of types of parasitic worms." University of Glasgow World Changing. University of Glasgow, 2010. 24 April 2019 <http://www.worldchanging.glasgow.ac.uk/article/?id=75>.